It's here! It's NEW! 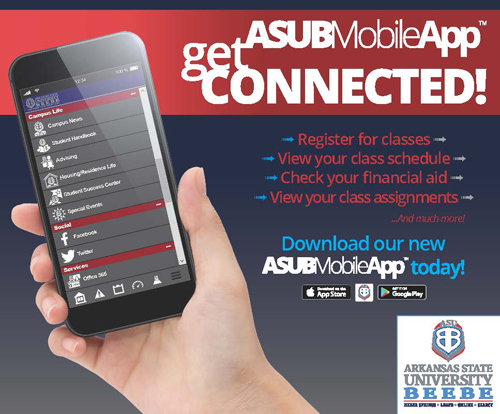 It's LIVE... Download the new ASUB Mobile App and Get Connected - Today! ASU-Beebe went LIVE with the launch of the University's first mobile app on Friday, June 1, 2018. The new mobile application will enable students and followers of the university to get connected to a wide variety of information right from their smartphones or tablets. The application has been in the works for approximately six months, and combines a number of technological advantages for students at ASUB. Now students can use their same login for their student portal on the asub.network on the mobile app and get access to their student information, email, campus news, class listings, grades, latest financial aid advisories and more. The app is reflexive and is available in the Apple I-Store and for Android devices it is available on the Google Play-store. Users should search for ASU-Beebe or ASUB mobile app.